We are a leading supplier and trader of Hose Box. Our offered products are Fire Extinguisher, Hydrant System and Fire Sprinklers. We have marked a distinct position in the market by offering our clients a broad array of Hose Box. 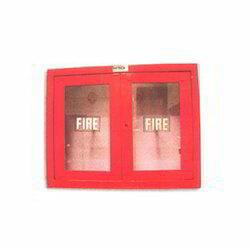 This hose box is available in varied sizes as per the requirements of clients. The offered hose box is manufactured using high quality material with the help of advanced technology. Further, this hose box is used for keeping fire hose securely and hassle-free. This hose box is offered at industry leading price to the clients.